The German-Dutch painter, watercolourist and printmaker made his debut in the National Gallery of Ireland in an exhibition running from 14th February to 10th June. The Colour is Life exhibition features the highly acclaimed work of the artist, with various themes displayed in collections throughout the spacious and airy rooms of the National Gallery. The artist was born in Nolde on the Dutch border of Germany in 1867, growing up at a time of political upheaval throughout Europe. His first experience of art was as the apprentice of a furniture maker and woodcarver. As a young adult, Nolde spent much of his time travelling throughout Germany, particularly Berlin, working in furniture factories. His time in Berlin is particularly evident in the paintings of vivid city life, using bold colour combinations and expressive brush strokes to paint the varying scenes of city night life and café culture. Nolde had a fascination with dancers and the beautiful way in which they used their bodies as an artistic tool, this fascination is evident in the exhibition as a running theme as he daringly painted scenes of dancers performing at a cabaret or caught up in movement on stage. Nolde belonged to the expressionist movement and took inspiration from artists such as Van Gogh and Paul Gauguin. At times, the work of the artist would look strikingly familiar to that of those he was inspired by, with his self-portrait being reminiscent in style to that of Van Gogh’s. Growing up at a contentious time in the social history of Europe, Nolde’s career as an artist was in full swing when Nazism emerged and gained momentum. Nolde personally agreed with the views and policies of the Nazi’s and was a member of the party but they condemned his work as being unreflective of the vision of Germany that they were trying to build and hailed it as ‘degenerate’. During this time period Nolde painted a collection of art that, in its entirety is known as his Unpainted Pictures. These pictures are ironically known as a symbol of resistance of the Nazi regime, despite his known affiliation to the party. A huge running theme in the exhibition were the times that Nolde spent in the South Seas. Nolde was fascinated with the distinctive build and style of the aboriginal people of countries such as Papa New Guinea. 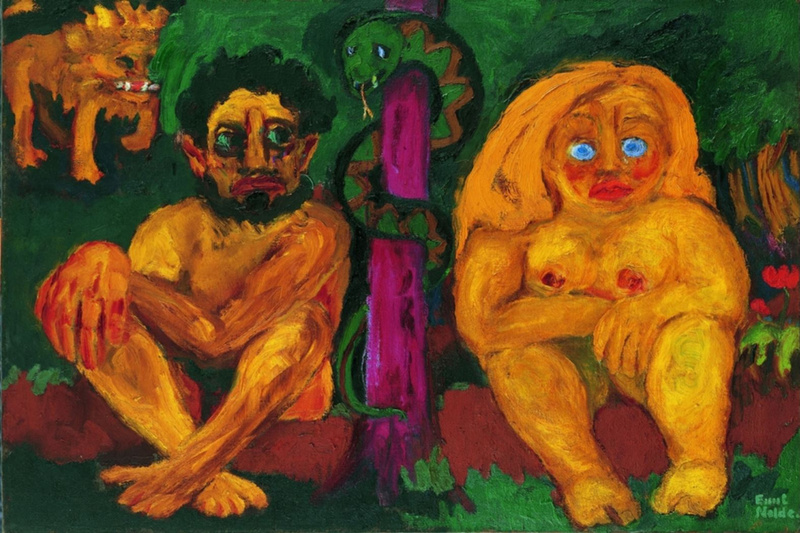 In his painting of aboriginals, Nolde stated that what he was doing was in fact revolutionary for the art world and that the only artist he knew doing anything similar in nature was Paul Gauguin. He painted both scenery and people. In his landscape paintings he cleverly used dark colours in the sky with areas of light and brightness to break up the image and give the impression of the early light of day or the approaching darkness of night. In his later, more mature works Nolde moved slightly away from the abstract, expressionist art into a more confined version of himself.